I’m not sure why, but I tend to think of Prometheus as a failure. A lot of that has to do with the response to the film online. It didn’t have a huge opening, however it did make over $400,000,000 at the box office. It also received mostly positive reviews praising the film’s beautiful but haunting visuals and the fantastic performances - particularly that of Michael Fassbender. Roger Ebert even gave it 4 out of 4 stars in his review, praising it for having the guts to ask a lot of tough questions it doesn’t have the answers to. But general audiences - or at least a fairly vocal online audience - didn’t appreciate that very much. Neither did they appreciate the fact that Prometheus was an Alien prequel that didn’t feature xenomorphs (which Covenant rectifies and reassures its audience of in the trailer) or the way it left a lot up in the air for the inevitable sequel-prequel. Covenant is that sequel, it picks up 10 years after the events of Prometheus and continues storylines started in that film. It features a crew mostly made up of married couples intent on establishing a human colony on a carefully selected world far away from Earth. Once they’ve settled they’ll get to work on bringing the two thousand colonists out of cryosleep - they also have a thousand embryos onboard. However, before the ship can arrive at their intended destination it’s hit by a neutrino burst that forces the crew out of cryosleep early. The damage ends up killing Captain Branson (James Franco) before he wakes from his slumber, and delays the ship long enough to pick up a distress call from a nearby Earth-like planet that mysteriously didn’t show up in their scans for a habitable planet. The now acting captain, Oram (Billy Crudup), decides to investigate the signal despite Daniels (Katherine Waterston) objection considering they’re not prepared for whatever they’re likely to find there. Oram is a leader of wavering confidence. He has a few private conversations with Daniels that establish that he had always been passed over for leadership roles due to his faith. That, it would seem, has lead to a severe lack of faith in his own ability to be the leader the crew needs. In fact, there are several moments in which he openly expresses to Daniels his self-doubt and growing fear of whether or not the crew trusts him and his judgement. However, there is never a scene in which anyone, other than Daniels, shows any sign of lacking confidence in him. Worse yet, his faith, that seems to be a theme Scott wants to make a point of, never really factors into the film. For all his mentions of religious faith, Scott really does nothing with it. It’s mentioned once or twice only to be dropped for the rest of the film. Daniels, on the other hand, is probably the leader the crew should have had. She’s heartbroken over the loss of her husband - the aforementioned Captain Branson - but is smart and resourceful enough to get through most of the trouble this film has to throw at her. She’s the Ripley or Shaw of this film. However, while Katherine Waterston gives a fine performance, the character is clearly the weakest of the three. That mostly has to do with the fact that she simply isn’t given much to do till toward the end of the film. Danny McBride’s Tennessee is probably the only other crew member who gets enough screen time that you’ll be able to recall his name by the end of the film. The only other detail about him I can provide is that he’s a pilot and he’s married to one of the other crew members. That leads me to one of the things I didn’t appreciate about Alien: Covenant. There were at least a few scenes that were seemingly cut in order to be used as promotional material before the release of the film. A handful of them are character profiles, teases that feature members of the crew narrowly escaping an alien while onboard the ship, and two prologues. Most of them feature material that takes place before the crew has gone into cryosleep. The first prologue features Noomi Rapace returning to her role from Prometheus as Shaw. She repairs David, who seems genuinely moved by her kindness. He then puts her into cryosleep for the long journey to the homeworld of the Engineers who supposedly created humans. The second prologue features the crew of the Covenant having a “last supper” before cryosleep. It’s akin to the dinner scene in the original Alien film. The crew laughs and has a good time together. It helps give us a sense of what some of these characters are like while establishing a bit the group dynamic. In fact, without this prologue the feature film does next to nothing to establish the relationships and personalities in this crew. The fact that the crew is made up of all married couples is supposed to add another emotional layer to every death. However, the film alone, without the prologue (I didn’t see them till after seeing the film), does such a poor job establishing the crew, outside of the three characters I previously mentioned, that I often couldn’t recall who was married to who. Worse yet, once this crew of names and faces I can scarcely recall finally do reach the mysterious planet, there is essentially no logic to any of the actions they take. The defense of this I’ve seen most often simply claims something along the lines of, “to err is human.” People make bad decisions in stressful situations. And most horror films won’t hold up under that kind of scrutiny. To that I say, yes normal people make mistakes. Highly trained, highly intelligent astronauts and explorers aren’t your average Joe though. They should know better than to make some of the stupid decisions made here. It is a weak defense of bad writing when a good horror film could have scared and thrilled the audience by killing off it’s sizable cast despite allowing them to make the sorts of decisions we scream at the screen for them to make. Good sci-fi frequently has characters that serve as audience surrogate. They ask the questions we're wondering. This film does none of that. There is enough crazy things going on on this planet that when a mysterious cloaked humanoid appears as if from nowhere to whisk them away to a safe place, you’d think some of these people might have had a few questions to ask him. Yet they all sit quietly licking their wounds while he disappears for some one on one time with the crew’s android. It also follows one typical horror movie trope around the block a few too many times to be ignored. In 2017 there is no surprising an audience with what comes next after a member of the group utters the line, “I'll be right back.” Separation from the group is the most obvious signal of a character's impending demise in any horror film. Yet that’s only one example of things this film does to telegraph its intentions. In fact, another point of contention here is the film’s final twist. Half the audience claims it to be so painfully obvious that it may as well not be called a twist at all. The other half of the audience defends it by saying Ridley Scott was not really trying to hide the “twist.” To that I say, there’s a very particular cut that seems awfully suspicious if he weren’t trying to hide anything. It seems both fairly clear what he’s building to and that he wants us to wonder whether or not he really did it. Perhaps it’s not surprising that the audience can’t make up their mind about it. I haven’t even mentioned the dual role here by Michael Fassbender. That’s because a lot of the film’s secrets revolve around the characters he plays and the actions they take. He, of course, reprises his role as the android David from Prometheus, but he’s also playing the role of a newer model android named Walter - built to serve the crew of the Covenant. 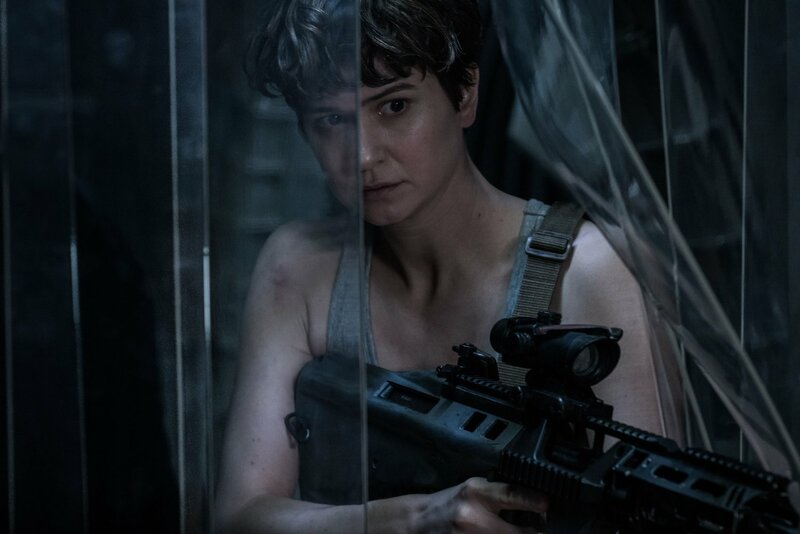 The most redeeming quality of Alien: Covenant is this dual performance. It’s so nuanced that Fassbender effectively plays these two separate people who, despite how similar they look, are nearly impossible to confuse. The accents he uses, the slight movements and minute facial expressions he makes all help to define which character is which at all times. Without spoiling too much, the revelations made here about David and his intentions retroactively make Prometheus a better film simply because we finally understand what he’s doing and why. Having said that, as a film, I prefer Prometheus to Covenant for the way it handles its human characters and its far more inventive action. Comparatively Covenant’s action feels lackadaisical in design. It features a handful of “expected” sequences that feel mostly like that of other scenes we’ve already seen in this series. At least Prometheus gave us a different take on the medbay scene we’ve seen so many times already. To an extent I agree with Roger Ebert’s review of Prometheus. Good sci-fi does deal in moral gray areas and ask thought provoking questions even if it doesn’t offer answers to those questions. Certainly Prometheus did that, and while Covenant expands on the themes present in Prometheus, it also doesn’t have all the answers you might be looking for. 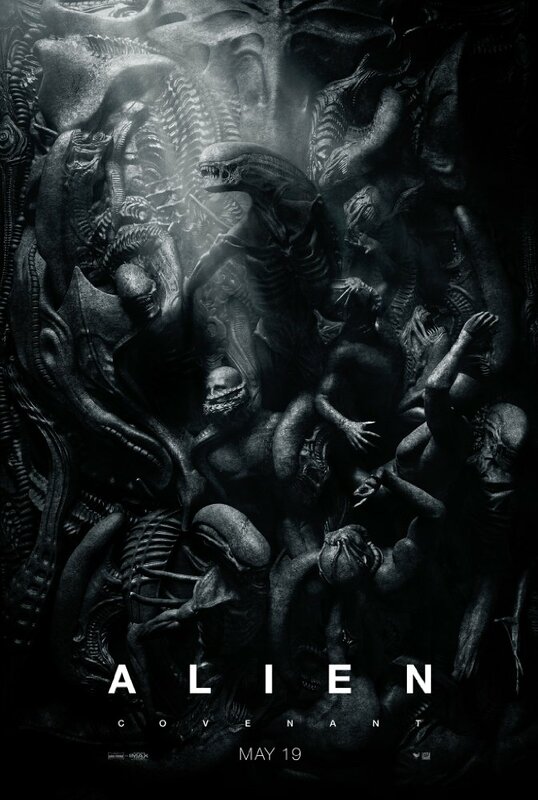 It completely drops the search for understanding of humanity’s creators in favor of an explanation of the origins of the xenomorphs. That may or may not frustrate the same viewers who were frustrated with Prometheus. As such, I suspect this film, much like Prometheus, is bound for a mixed reception. Some might even bristle at the idea that these prequels exist to answer a question no one really needed the answer to. In making these films, Scott is demystifying​ the titular monstrous creatures in ways that may not even agree with other films or media in which the xenomorphs appear. All of this may be fine for some viewers but it's sure to irk others. David asked a character in Prometheus why humans made him. The response was, “because we could.” David's response is something along the lines of, imagine how disappointing it would be to learn that was the reason for your existence. “Because we could,” feels like the reason Ridley Scott revisited the Alien franchise to place these themes of creation and destruction. I won’t say I don’t find them intriguing, though I wonder if they might have been better served in Scott’s other sci-fi series about artificial intelligence, Blade Runner. Now we’ll have to wait and see if he can find interesting ways of differentiating the themes of these two franchises.